Once again, strange folk descend upon the forest of our fair Tank Hill to haunt us with epic tales of tragedy and then, with a change of outfit, beguile us with raucous comedies. They call themselves actors, others call them thespians. They worship strange creatures, but none stranger than the one they call the Bard, who compels them to act out his plots for days on end, in rain or blistering heat, with little rehearsal. He pays them naught but in the cheers or jeers or tears of their beggar audience. Back for their 11th season, the Lakeside Shakespeare Theatre (LST) will again be performing one tragedy (Richard III) and one comedy (Twelfth Night) in Frankfort on alternating evenings from July 15 through July 25 (with the exception of taking one night off on July 21). 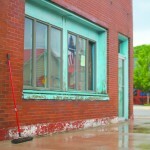 This year, the company began rehearsing in Benzie County on Sunday, July 13, running through the first half of Richard III from just after breakfast until just before lunch. A short break for the peak of summer heat in the afternoon – during which, most cast members apparently nap – they then ran through the second half of the tragedy. On Monday, July 14, the cast then spent morning and afternoon running through Twelfth Night. Given that the preview performances on Tuesday and Wednesday, July 15 and 16, are full dress rehearsals that are attended by the public, that means they’ve been in Benzie County just over 48 hours before they begin performing. Yet, despite the insanity, they keep coming back. Christy Arington, LST’s education director, is in her 10th season, having participated every year except the first. 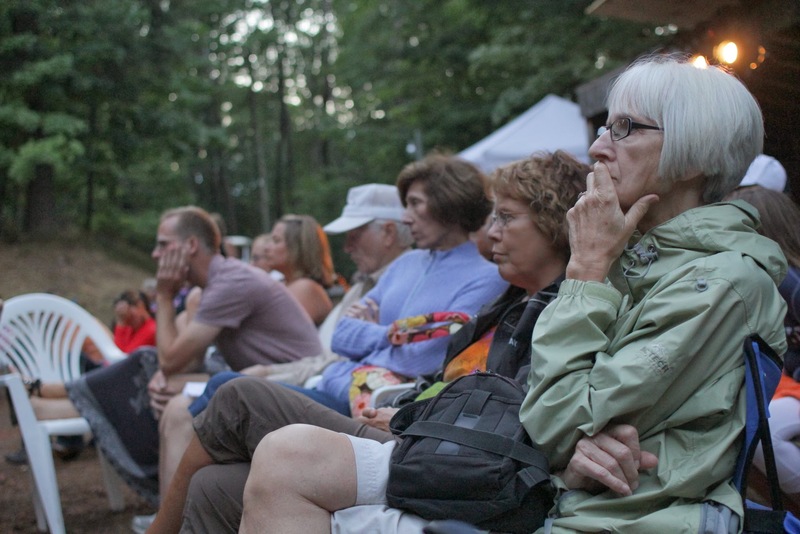 Arington says that performing Shakespeare in Benzie County is like no other audience experience. From year to year, the company cycles people in and out depending upon their availability – Lily Mojekwu (Margaret in Richard III and Maria in Twelfth Night) took a year off but has returned for her fifth season; Jill Rafa (Lady Ann in Richard III and Fabian in Twelfth Night) took a year off but has returned for her seventh season – but this is the first year that the show will go on without Laidlaw. This summer, Sara Gorsky has taken over as managing director, because Laidlaw has had to spend her time in Chicago shooting a film. Now in her fourth season with LST as she takes the helm, Gorsky will not only be found behind the scenes – she plays Viola, one of the leads in Twelfth Night, as well as Catesby and Murderer #1 in Richard III. Gorsky echoes Arington’s sentiments about the Benzie County audience being a top reason for return. “We all work for a lot of different companies in Chicago – as an actor, you work wherever you get cast – but the audiences here are really unique to all audiences that I’ve ever had. I feel like they are involved and excited about Shakespeare and about the plays and about supporting this company in a way that I don’t see everywhere,” Gorsky says. Another way that LST makes 15th and 16th century Shakespeare accessible is they shake things up. From composing their own catchy soundtrack for a comedy to setting a contemporary scene for a pair of star-crossed lovers, the group finds new and interesting ways to envision the Bard’s works. Last year, for instance, Juliet could have easily been a summer-resident teen in her polo shirt and tennis skirt, while Romeo’s buddies sported Frankfort Panthers’ purple and gold under their leather jackets. Sometimes, though, it’s the venue that makes these timeless plays come to life. When LST made the switch from its original Elberta location (at the amphitheater in Waterfront Park, near the Lifesaving Station) to its current Frankfort location (at Tank Hill Park, just down the hill from Paul Oliver Memorial Hospital and across the street from St. Ann’s Catholic Church), the company was putting on King Lear. On opening night, a family of deer walked across the forest ridge behind the stage. During one performance of Macbeth the next year, vultures were circling above while the witches, who were covered in blood, were coming out of the forest. 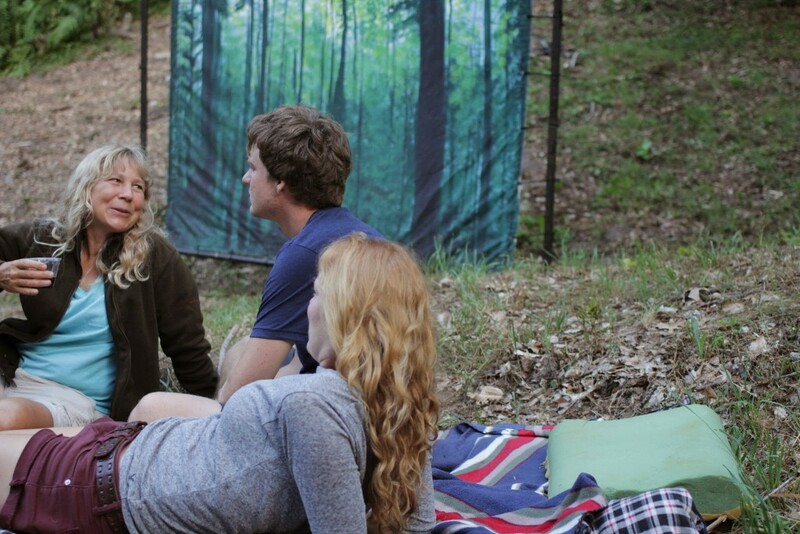 Also in 2011, a neighbor dog was on a jaunt in the woods with Queen Titania’s fairies during A Midsummer Night’s Dream. For the two weeks that they are here, the players live and eat together; they work and play together. This year, six college interns are living in a loft space above a garage, while about one-third of the company is currently holed up at La Rue House in Elberta. 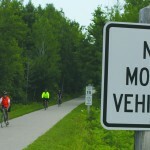 Once rehearsals slow down and production gets going, the group will spend their days pre-performance swimming Benzie County’s waters and biking its trails. Jeff Christian (Richard in Richard III and a sea captain in Twelfth Night) is a founding member of LST who remembers being nervous that no one would show up on opening night of the first show back in Elberta. Now LST drums up more than 1,000 audience members per season. Not only do the players talk with audience members, they occasionally even use them as props – tripping over someone’s chair during a comedy or faux-whispering into someone’s ear during a monologue. Moreover, a pair of actors may rifle through your picnic basket, picking out what they want and carrying it off with them. Richard III will be performed July 17, 19, 22, and 24, with a preview performance on July 15. Twelfth Night will be performed July 18, 20, 23, and 25, with a preview performance on July 16. Regardless of weather conditions, all performances will begin at 7pm at Tank Hill in Frankfort. Performances are free for all ages, but donations are greatly appreciated. And make sure to sign your kiddos up for the children’s workshops that will be taking place July 22 to July 25. Check out http://www.lakesideshakespeare.org for more information.